The RJ Power Networks (RJP) team has completed the complete refurbishment of 2 No. existing 6.6kV/433V substations at the Victoria and Albert (V&A) museum in London. The V&A is the world’s leading museum of Art and Design and houses a collection of over 2.3 million objects spanning over 5000 years of creative history. The museum attracts visitors from all over the world and is an iconic part of London’s make up and we are proud to have been instructed to deliver this project for them. The project duration was four weeks and at no time was the public access to the museum to be affected, as it was scheduled to run over a school holiday, which is peak footfall time for the museum. With this in mind, there was only allowance for minimal shutdown times, with each shutdown to be completed overnight on Sunday to the early hours of Monday morning, with one shut down providing the Networks team with only 2 hours to complete all of live testing, commissioning and HV Switching. Due to the logistics of the project being extremely challenging, the team had to work with the equipment suppliers and the logistics and plant moving company, DSM Ltd, to create a bespoke installation solution involving multiple challenging lifts with a crane with little room for error (40mm). This also proved challenging when it came to the team’s own materials and equipment down to the moat. The use of the crane for the project required two road closures of Cromwell Place to be able to operate the crane safely, however the scheduling of the road closure took extensive prior planning and cooperation between RJ Power Networks, Royal Borough of Kensington and Chelsea council and the V&A museum, to be able to organise a date and time that suited all parties. Both road closures were a success and the lift and shift completed by DSM Ltd was outstanding. As a result of the tight space and unique installation plan, the RJ Power Networks Team had to organise the two transformers to be shipped and delivered in parts. Each transformer had to be manoeuvred through a single door opening with 20mm clearance. The manufacturers were then required to attend site to build, fill with oil, commission and hermetically seal the two transformers in situ within the substation at the V&A museum. “The V&A museum commissioned the design of a complete refurbishment of 2 No. existing 6.6kV/400V substations. RJP provided pre-construction advice and supported the client’s design team during the design development stages of the project. “Following the contract award, RJP were quick to mobilise and provide the necessary CDM advice and documentation. The projects budgetary constraints meant that it was necessary to separate the equipment procurement from the execution of the works; which RJP supported and delivered the project over two financial terms. “RJP; unprompted provided all necessary construction documentation to the clients team; avoiding the need for a protracted approvals process at the critical stage of the Construction programme. “The installation of the transformer was a challenging operation and RJP worked with their logistics company to provide a bespoke equipment installation solution; meeting the requirements of the local authority and addressing the client’s concerns with respect to the moving of equipment close to the listed building fabric. 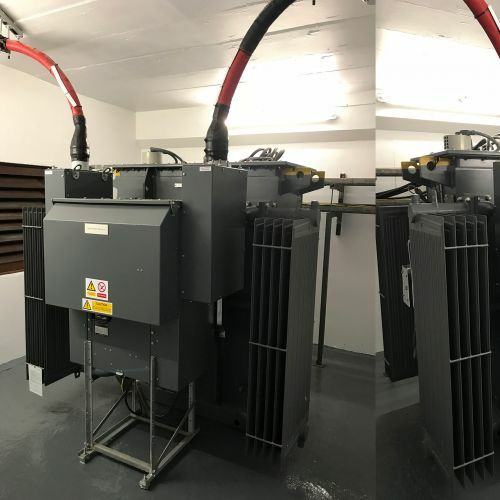 The Midel filled Transformers were installed in the constrained substation in modular form and reassembled by the specialist equipment supplier; who provided full testing certificates. The Networks teams’ undertook extensive planning and preliminary works to enable the project to run without delay or failure. The team were successful in implementing this plan and the job ran smoothly. As always, well done to the RJ Power Networks team and especially to Callum Turner – the lead Project Engineer – for the organised and well executed job. The Victoria and Albert museum job was completed to the exceptionally high standard that is expected from RJ Power by its clients.